Featuring a contemporary design with commodious two drawers, attached by metal pull-out handles. This night stand becomes a complete solution for bedroom, storing bedtime essentials. Enough spacing of two drawers allows you to reach to all important commodities in one go easily. All drawers also features English dovetail construction. 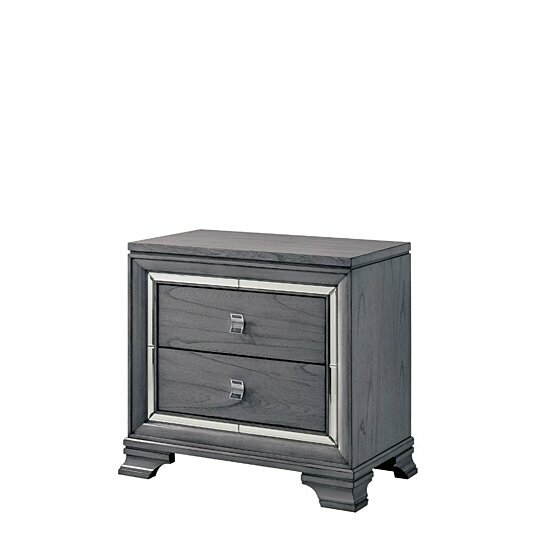 Sturdily made up of solid wood and metal, this nightstand is finished in light gray color. This simple yet functional nightstand will bring a beautiful accent to any bedroom decor. Features two drawers that provide great storage and metal handles provides easy opening .